Frequently referred to as CABG surgery, or open heart surgery, coronary artery bypass graft surgery is the surgical treatment of choice for blocked arteries surrounding the heart. The heart pumps blood for the entire body but still depends on a series of blood vessels called the coronary arteries for its own blood supply. If the arteries become severely blocked — a condition known as coronary artery disease — oxygen does not reach the heart muscle and damage occurs. Open heart surgery, or bypass surgery, is considered the "gold standard" treatment of coronary artery disease. To prevent damage to the heart, flow through the coronary arteries must be increased. During open heart surgery, the blocked arteries are removed or bypassed with blood vessels taken from another part of the body. In most surgeries, two to four coronary arteries are grafted to ensure adequate flow to the heart. Bypass surgery is often described in terms of how many bypasses are completed, such as a double bypass, triple bypass or quadruple bypass. Many cardiac surgeons order extensive testing before surgery to determine which arteries are obstructed and the severity of the blockage. An angiogram is one outpatient test that uses x-rays to determine the severity of coronary disease. A stress test, electrocardiogram (EKG) and blood tests are usually done in advance of the surgery. Blood tests may be repeated immediately prior to surgery to determine if the patient is likely to bleed during surgery, along with their general health. A surgeon may have very specific instructions for a patient scheduled for bypass surgery. These instructions may include changes in prescription medications, diet and drinking, and smoking habits. An open heart bypass surgery is performed under general anesthesia, which requires that the patient is on a ventilator during surgery. Surgery begins with harvesting the blood vessels that will become the grafts. The saphenous vein in the leg is commonly used because it is long enough to create multiple grafts. If the saphenous vein cannot be used, vessels from the arm can be used instead. The left internal mammary artery is used for a single graft and is taken once the chest is opened for surgery. Once the saphenous vein has been recovered, the chest is opened by making an incision along the sternum, or breastbone. The surgeon then cuts the sternum, allowing the chest cavity to be opened, giving the surgeon access to the heart. In the traditional CABG procedure, the heart is stopped with a potassium solution so the surgeon is not attempting to work on a moving vessel, and the blood is circulated by a heart-lung machine. At this time the heart-lung machine does the work of the heart and the lungs, and the ventilator is not used. The surgeon places the grafts, either rerouting blood around the blockage or removing and replacing the blocked vessel. The amount of time on the heart-lung bypass machine is determined by the speed at which the surgeon is able to work, primarily, how many grafts are needed. Once the grafts are complete, the heart is started and provides blood and oxygen to the body. The sternum is returned to its original position and closed using surgical wire, to provide strength the bone needs to heal, and the incision is closed. The procedure for beating heart, or “off-pump” surgery is essentially the same as the on-pump surgery, but the flow of blood through the body is maintained by the heart during the procedure. Instead of using a heart-lung machine, the heart continues to beat but the area being grafted is held still by surgical instruments. Approximately 20% of first time CABG patients have off-pump surgery. 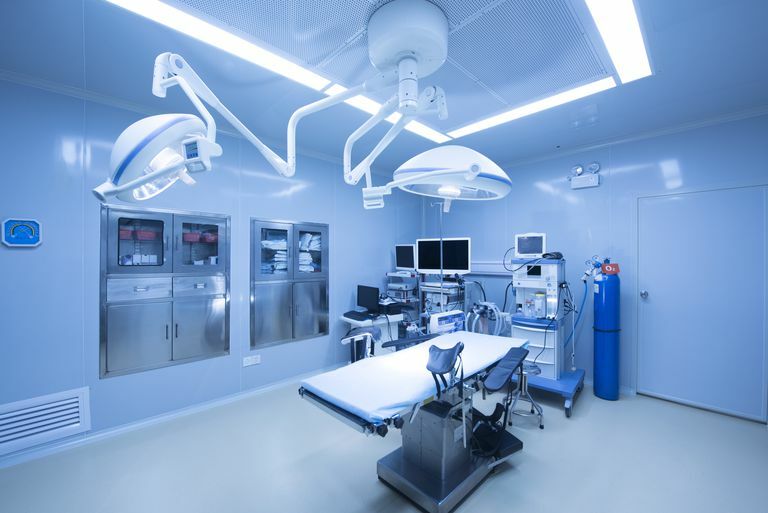 In many surgeries, drugs are given to wake the patient immediately after the incision is closed. Most surgeons opt to allow CABG patients to wake slowly, to prevent any stress on the heart that might happen when waking abruptly. The patient will be taken to the recovery area, usually a cardiac or surgical intensive care unit, for care while coming out of anesthesia. The critical care environment is necessary to provide the patient with one on one nursing care and constant monitoring. At this time the ventilator will remain in use, providing breathing support while the patient remains sedated. One or more chest tubes, large tubes that are inserted around the surgical site, help remove any blood that may have collected around the heart. A large IV called a Swan-Ganz will also be in place, allowing staff to monitor critical heart functions and infuse medications. Once the anesthesia drugs wear off and the patient is awake, the breathing tube is removed (a process called extubation) and the patient is able to breathe on their own. Immediately after extubation, supplemental oxygen may be given by nose to assist breathing. Oxygen levels and breathing will be closely monitored and if a patient cannot breathe adequately without the ventilator, the breathing tube will be reinserted. Once awake and breathing on their own, the patient will begin rigorous rehabilitation, starting with sitting on the edge of the bed or standing and walking a few steps to a chair. The patient will be instructed in ways to move that minimize pain and how to protect the surgical wound. At this time, pain medication is available to allow the patient to move without intense pain. A CABG patient will typically stay in the intensive care environment for at least twenty-four hours. The chest tubes are usually removed within forty-eight hours of surgery, before transferring to a step-down unit. Many CABG patients indicate a significant improvement in pain level when the chest tubes are removed. CABG is not a cure for heart disease; it is a highly effective treatment. A CABG patient who does not follow their doctor’s instructions to change their diet, quit smoking, exercise, lose weight or control their blood sugar may find that their coronary artery disease has returned, and is blocking the new grafts. Some patients may require rehabilitation after returning home to help with strength and stamina. Some facilities have a specialized heart rehabilitation program while others use the services of physical therapists. Raja S, Dreyfus G, “Will off-pump coronary artery surgery replace conventional coronary artery surgery?” Journal of the Royal Society of Medicine, Volume 97, June 2004.